After the dramatic destruction of Count Dracula, Jonathan Harker has settled down to a quiet life as a junior partner in a law firm. But his reputation is about to catch up with him. As word of his abilities spreads, clients are turning to him for help with problems which appear to have an involvement in the supernatural. 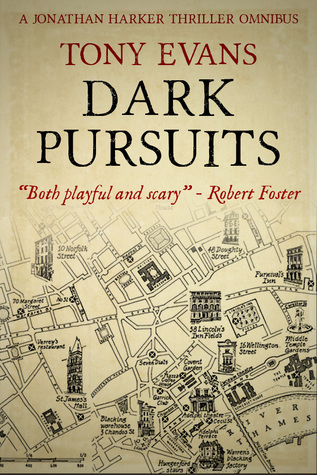 Dark Pursuits is a fun and easy read that I finished over two sessions. I liked Evans' idea that, after defeating Dracula, Harker might find himself called upon to assist in other supernatural mysteries; however, I feel the cover description of the book as a thriller is slightly misleading. The stories are intriguing and kept me turning the page, but at no point was I afraid or on the edge of my seat. They are more playful than chilling. If you're looking for a dark read for a stormy night, this probably isn't the book for you. If, on the other hand, you are looking for a fun read to pass a few hours, and if you enjoy spin-off tales from other books, then it is worth checking out this one. I'd rate it 3.5 stars.